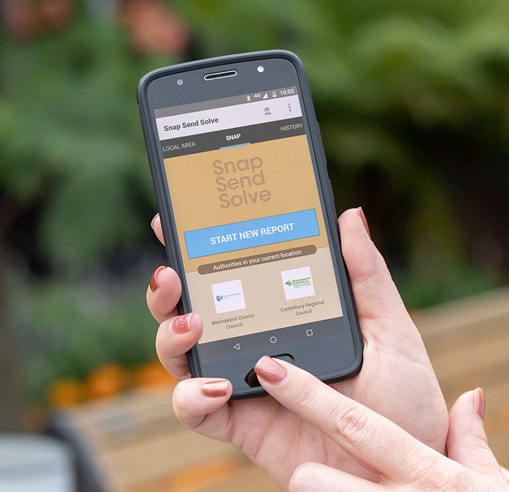 Snap Send Solve is a smartphone app to help make reporting issues easy. If you spot something in our district such as a pothole, vandalism, litter or damaged footpath, you can report it instantly to the Waimakariri District Council from a mobile phone. The app works by identifying the location the photo is taken using the phone's GPS data. It sends an email to the Council from the user's email address, including the incident type, notes, address of incident, photo and the user's contact details. The report is then allocated to the relevant Council department. The more information provided, the better we can help isolate and investigate the issue. Council receives an email with your report and a service request is generated. The Snap Send Solve the Council system is reliant upon the internet email systems. Delays in the delivery of email messages may occur but this is beyond the control of the Council. If your issue is urgent, you should ring the relevant emergency service provider or phone Council's Customer Services on 03 311 8900. Download the app onto your phone and start reporting. or visit the Play Store (Android) or the App Store (Apple) on your smartphone and search for 'Snap Send Solve' to download the app. Issues can still be reported by filling out an online service request, emailing office@wmk.govt.nz, calling us on 0800 965 468, or visiting one of our service centres. Snap Send Solve is now available as a web app to people who don't have the iOS or Android app installed on a smartphone. The web app is designed for multiple platforms, including iOS and Android devices and PCs using the latest version of Chrome, Firefox, Safari and Internet Explorer. To use the web app, go to https://report.snapsendsolve.com/ and start reporting. Note: Issues reported using Snap Send Solve can only be attended to during normal office hours. If you have an urgent request outside of office hours, phone 0800 965 468.